The John M. & Marilyn Zeigler Student Achievement Award honors the past contributions to student needs of Dr. John Zeigler, the first SMS Associate Dean of Graduate Studies, and the continuing contributions of Mrs. Marilyn Zeigler. The Zeigler award formally recognizes students who excel in scholarship, leadership, research initiative, outstanding publications, and exceptional thesis or dissertation work. This year’s award recipient is Charles (Chip) Cotton. It is my pleasure to honor Chip Cotton as the recipient of the Zeigler Student Achievement Award. It is no exaggeration to say that Chip is one of those “once-in-a-generation” graduate students. Chip and his c0-advisor, Tracey Sutton, knew each other prior to Dr. Sutton’s arrival at VIMS. They work on a Census of Marine Life project that involves more than 100 scientists from 17 countries. The core of the project is a small team of world authorities in deep-sea taxonomy. Of these, Chip is the only graduate student, which speaks volumes for his international reputation. The high regard for Chip has only increased since Sutton’s arrival at VIMS. One of Dr. Sutton’s primary responsibilities is leadership of the shark survey, a program that has hundreds of moving parts, all of which must be done in a consistent manner for continuity. Without Chip’s help, the transition could potentially have been a disaster. Chip jumped in whole-heartedly, even at the peril of his own graduation schedule, to save the day. The program simply could not have continued without him. Chip displayed selflessness, competence, composure, patience, and attention to detail that made the shark season a complete success. 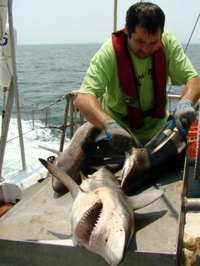 Simply put, Chip essentially ran an internationally recognized shark program singlehandedly, with assistance from the chief scientist, and three first-year graduate students. Dr. Musick has had many outstanding students; Chip certainly continues that tradition. He is now and will continue to be a credit to the VIMS educational program. Chip is truly an exemplary VIMS student and highly deserving of the Zeigler award.